As a member of the House Education and the Labor Committee, I have the unique opportunity to work directly on meaningful reforms to education in a manner that will best serve Georgia and the nation as a whole. A quality education is vital to the success of our nation’s youth and I will continue to work tirelessly to ensure that our nation has a modern education system that puts students first. Under the jurisdiction of the House Education and Labor Committee, I have also been selected to serve as the Senior Republican on the Early Childhood, Elementary and Secondary Education Subcommittee for the 116th Congress. This subcommittee addresses a variety of issues ranging from early childhood programs like Head Start, to career and technical education, to school safety – issues I have been a passionate advocate for over the last four years. And with nearly 7 million available jobs throughout our country, it is critical that we cultivate a qualified workforce to fill these positions - and this mission starts in the classroom. As the Senior Republican, I look forward to working with my colleagues to ensure that K-12 education remains local, while also providing appropriate federal support so that our nation’s bright young scholars are sufficiently prepared to enter the workforce and achieve the American Dream. Building on this notion, I have also been a vocal supporter of school choice throughout my tenure in Congress. God created every child to be unique, each with special gifts and ideas that only he or she may have. I believe that families should have the opportunity to select a K – 12 education environment that is best suited for their children, from traditional public schools to homeschooling. By empowering parents with education options, school choice is playing a vital role in helping children leave underperforming schools and access a quality education. States and local communities remain at the forefront of this great effort. I also firmly believe that we must expand our skilled workforce to get our economy growing. Education is essential to workforce readiness and must be aligned with the in-demand jobs of our community and state. With this in mind, I was proud to support H.R. 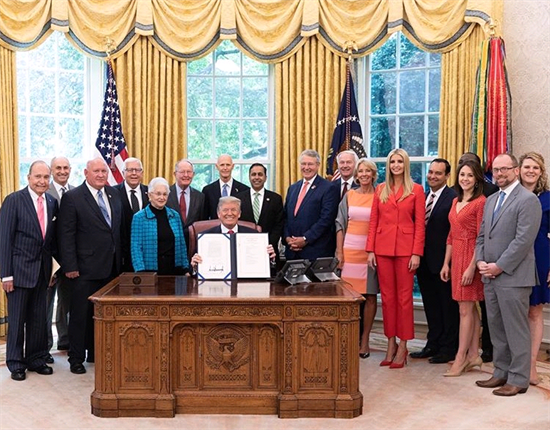 2353, the Strengthening Career and Technical Education (CTE) for the 21st Century Act, which President Trump signed into law on July 31, 2018. As a small business owner in the construction industry for over 40 years, I have experienced firsthand just how hard it can be to find skilled and qualified workers and I was honored to stand by President Trump as he signed this critical legislation into law. The Strengthening Career and Technical Education for the 21st Century Act helps to change the narrative that a four-year college degree is the best option for all of our students. This bill bolsters Americans who wish to pursue different paths, such as career and technical programs, which are leading to some of the most in-demand and high-paying jobs available today. As the law of the land, this legislation has already begun to bridge the gap between our business and education communities, and is leading to a renewed sense of optimism that we will see for years to come in our workforce. With regards to higher education and during the previous Congress, the House Education and Labor Committee developed a vision for the future of higher education. Our vision was aimed at simplifying and improving student aid, promoting access to postsecondary education, empowering students to make informed decisions by strengthening transparency, and limiting the role of the federal government by reducing bureaucratic red tape. With this in mind, I was proud to support H.R. 4508, the Promoting Real Opportunity, Success, and Prosperity through Education Reform (PROSPER) Act during the 115th Congress, a major overhaul of the higher education system and 9 years since the last reauthorization of the Higher Education Act. This bill made significant student loan reforms to help tackle this growing issue of student debt in a responsible manner. Additionally, since 2013, the total of student loan balances in the United States exceeded $1.5 trillion; over quadruple what it was in 2003. Furthermore, the average debt for an undergraduate degree has exceeded $30,000. Therefore, we must enact market driven reforms, so we can empower students to take fiscally responsible steps to tackling the growing student debt. Students should be fully informed of the responsibility of taking out loans and what that can mean for their financial future. Depending on the chosen career path, debt can be more difficult to pay off over time. Financial education is the key to avoiding excessive amounts of debt. As a member of the House Education and Labor Committee, I will continue to work with my colleagues on meaningful reforms to higher education in a manner that will best serve the students in Georgia and across the nation.